Want to make your photographs stand out, be more striking? 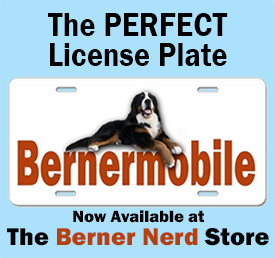 Want to transform those happy snaps of your Berner from blah to beautiful? A very simple technique can make a world of difference in the way you see and compose your photographs. Wander through a museum and look at the work of master painters. Watch great films. Open up National Geographic. Notice how often the primary focal point isn’t dead center. It’s a little left. Or a little right. Or in the top third or bottom third. The photo at the top of this article may not be a museum piece, but here’s a great example of the Rule of Thirds. Notice the major focal points. The dog’s face is in the upper right. And the road (which serves the purpose of the horizon) runs along the top. It creates tension. It makes what might have been a static picture more dynamic and more interesting. Right? What you’re seeing is the Rule of Thirds being applied. Imagine your image being broken down into thirds, both horizontally and vertically. 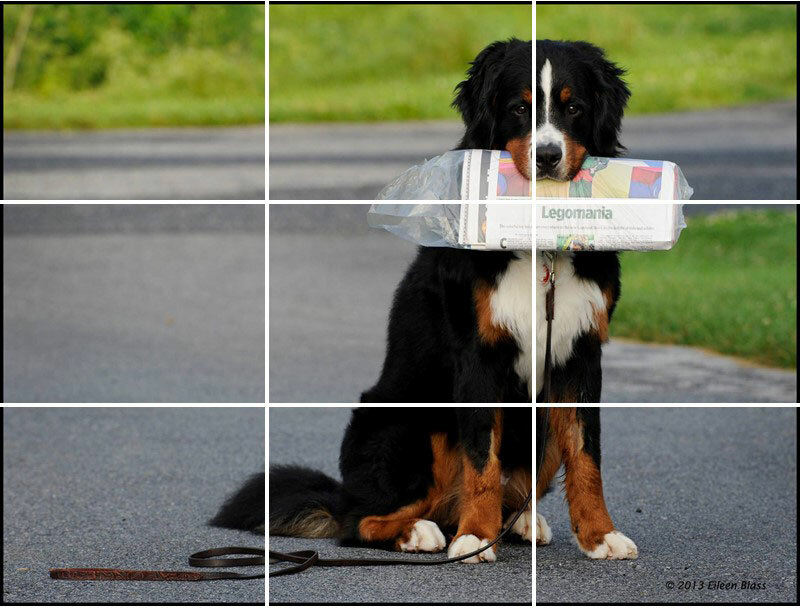 Let’s look at that same photo with the grid on it. Notice that the main focal point is Teddy holding the paper. It’s in the upper right third. Right where the lines intersect. And the road runs lengthwise through the top third. Think before you click: Compose! 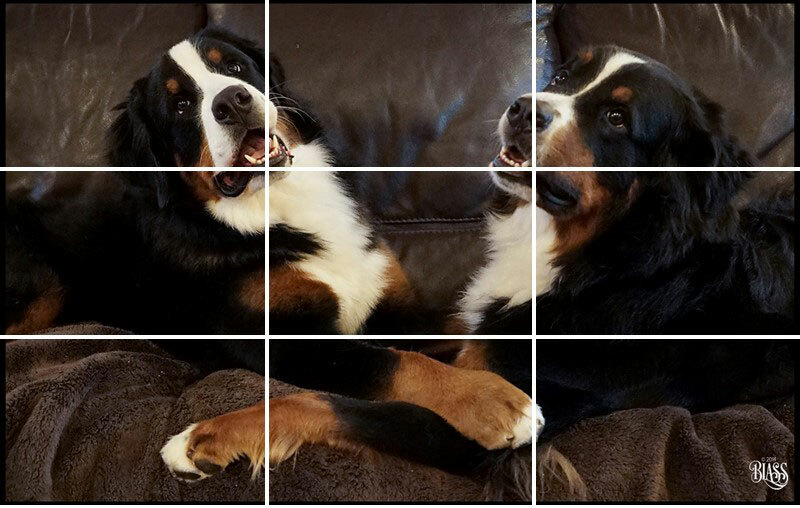 Now when you frame that shot of your Bernese Mountain Dog, visualize those two vertical lines and two horizontal lines. Your picture has points of interest (a face, a horizon, an object) and those points of interest should be placed near or along those lines or near the intersection of those lines. As you will notice, placing an important element of your picture smack in the middle isn’t all that interesting. 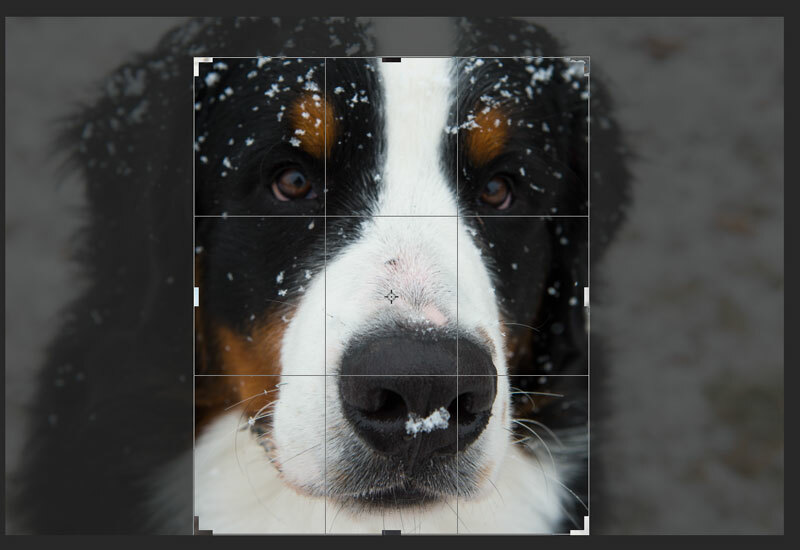 The bottom line is that you can improve the composition of your picture by simply paying attention to placement. And pay special attention to your horizon. In general, the horizon shouldn’t cut a picture in half. It makes the photo boring. 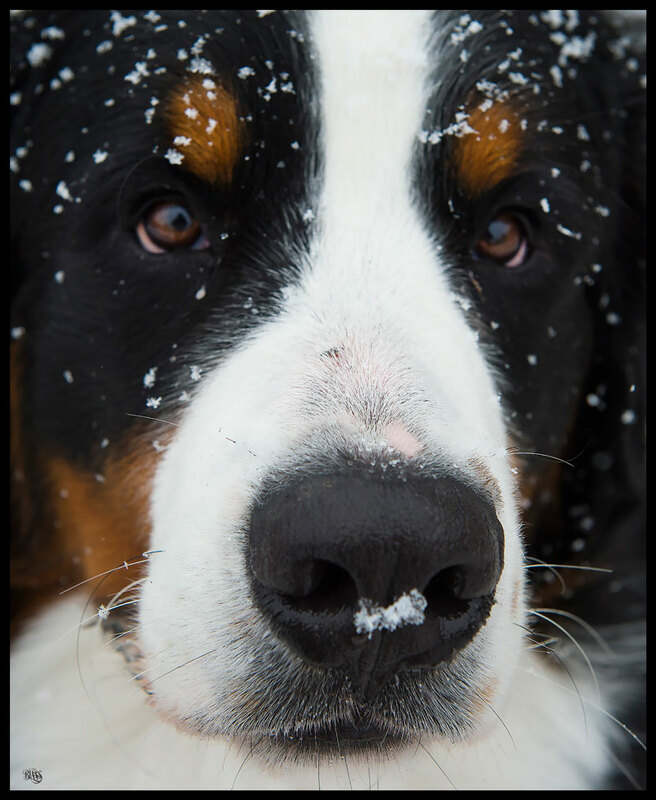 So when you’re out there with your Berner in the yard, think of where he is in the picture, where’s the fence and where’s the horizon. Is the horizon in the bottom third of the picture? In the top third? Or is it right in the middle? Think about it. 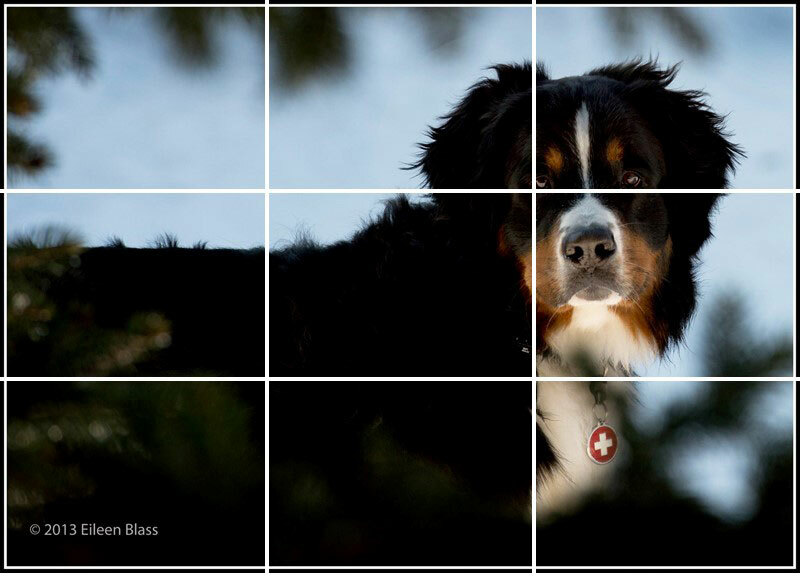 OK, to help you burn it into your mind, here are some more examples of the Rule of Thirds. the upper right vertical space. You can improve a picture with a good crop. 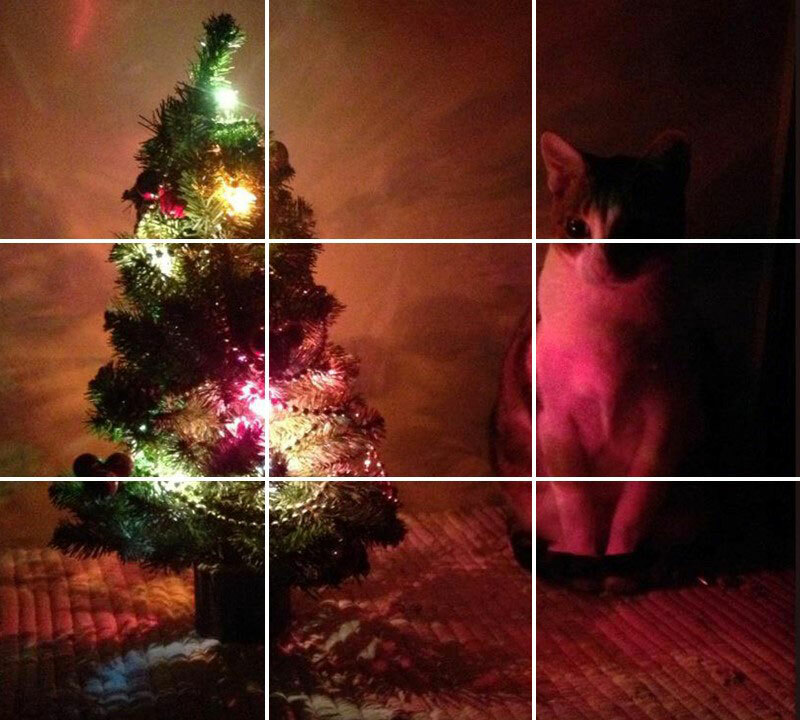 Think about the Rule of Thirds when you are cropping. These days, it’s so simple to crop pictures right on your phone before uploading to your favorite social media site. Take the extra time to crop when you can. Here’s an example of my dog Merlin just from today. 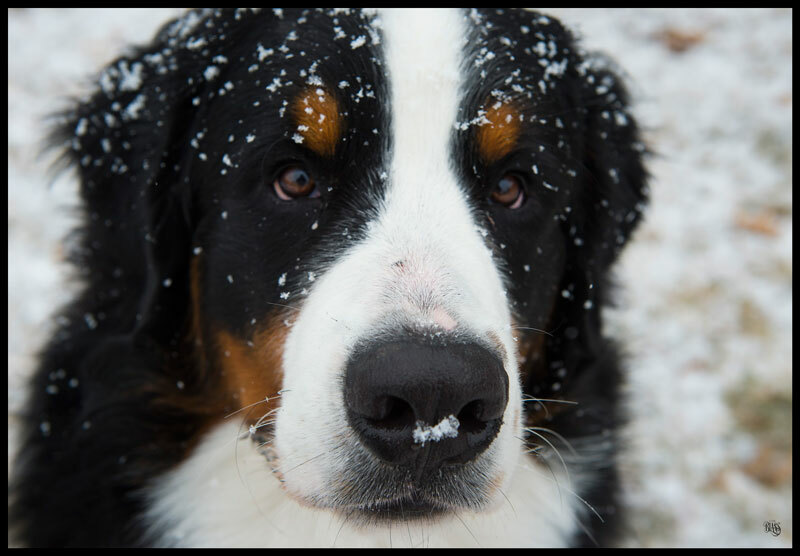 I photographed him in the yard during a snow shower. The picture is ok.
You can see that I didn’t place him right in the middle of the picture. But the truth is, the picture is a little bit boring even if he’s a bit off center in the frame. So I cropped this picture to be a vertical for more impact, and I was thinking about the rule of thirds when I cropped it. Merlin’s eyes are at the top horizontal line and each eye is near the vertical line that intersects. It makes a big difference. So now it’s your turn. Experiment with your pictures. Try to compose them while you’re shooting and think about what you can do after you shoot the picture to help it be more dynamic. Another fabulous lesson Eileen! Thanks!! Great tips thank you ! I will try .now how to photograph dark coloted dogs please ! That’s a good idea. I’ll think about that one. It’s all about the light. Great article Eileen, love the after the fact article, and how striking the photo can become. Keep up the great work!!!!! Love it!!!!! Thanks Ruth. It’s good to see the original and how it can be improved greatly by a simple crop. So cool! 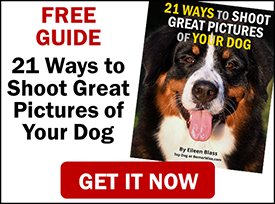 Thank you for the great tips on how you take such wonderful photos. Taking the time to crop is important too. Thanks for the feedback Sue. I really appreciate it. Thank you for the tips. My pictures have always looked like a 1st grader took them. That’s probably an insult to 1st graders. Hopefully my pictures will improve. thanks for these tips! However, I still will never get photos like you! I will think before I snap, though!